Francoise Sagan, the French novelist and playwright has died in France at the age of 69. Born in 1935 she achieved instant success with her first novel Bonjour Tristesse, the story of a bored, bourgeois teenager in 1954 when she was just 18 years old. She went on the produce over 40 novels and plays. Always something of a rebel she was also known in later life for her love of fast cars, for drug abuse and for tax evasion. She had been suffering from heart and lung problems for some time. John Seymour, who penned 41 books, mostly on farming of the self-sufficient variety, died recently aged 90 years. His best known title, The Complete Book Of Self-Sufficiency, sold over 1 million copies and has been translated into 20 different languages, and uniquely, it helped launched the publishing phenomenon which was Dorling Kindersley. 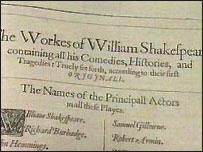 Only the sixth copy of the Shakespeare first folio, the first collection of his plays which had a printing of only 750 copies, has come to light. After the death of the owner in London in 2002 it took 2 years to trace the residual legatee, a Mrs. Anne Humphries of Manchester. The folio will be offered by Bloomsbury Auctions on 7th October and has a reserve of £80,000. The last copy offered at auction, a more complete example, made £4 million and so that reserve may be somewhat conservative. Gateway Monthly, the online magazine on fantasy and children's fiction has an interview this month with Mary Cadogan, author of the girls' fiction classics 'You're a Brick, Angela!' (with Patricia Craig) and 'Chin up, chest out, Jemima!'. She includes comments about some of the popular, timeless but perhaps less politically correct children's authors, some modern children's writing and the trends in current children's publishing. Click on the image to see the interview in full. Nevil Shute Norway was born 17th January 1899 at Ealing, London, the youngest of two brothers and the son of a senior civil servant in the General Post Office. At an early stage it was obvious that his interests lay not in things academic but in things practical, having been caught playing truant from school only to spend his time studying the mechanical exhibits in the Science Museum in South Kensington. The family moved from London to Dublin in 1912 when his father was appointed Secretary to the Post Office in Ireland. Nevil Shute had attended various schools in England including Shrewsbury and it was whilst on holiday from there that he was in Dublin during the Easter uprising in 1916, and acted as a stretcher bearer. In June, 1915, his older brother Fred had died of wounds in Flanders during WW1. He was quite philosophic about his future at this stage having seen a number of his seniors at school killed in the fighting in Flanders as well as his brother. His stammer, from which he was to suffer to some extent throughout his life, probably saved him from this fate as it prevented his earlier attempts to obtain a commision in the army and then the new Royal Air Force. After enlisting in the ranks of the Suffolk Regiment he was posted to the Isle of Grain in the Thames Estuary for the last three months of the war. After the war he was demobilised and secured a place at Balliol, Oxford, where he studied Engineering, graduating in the summer of 1922. During the vacations he became acquainted with boats by acting as crew on a sailing cruiser and had already started his connection with the aircraft industry, working unpaid at De Havillands and it was Geoffrey de Havilland himself who gave Nevil Shute his first experience of flying. His first full time work was at De Havillands near Edgware in January 1923 where he was employed as a performance calculator. He started writing in his spare time in the evenings, first poetry and then a novel, and in the spring he learned to fly. Finishing his first novel later in 1923 he sent it to three publishers and was turned down by them all. A second attempt followed in 1924 with the same result. Later that year he left De Havillands to join the Airship Guarantee Co. at Howden, Yorkshire, a subsidiary of Vickers, as chief calculator on the R100 airship project. This was the private enterprise project while the Air Ministry would build state project R101 in competition. (Chief Engineer at the Airship Guarantee Co. was Barnes Wallis, later to become well known as the designer of the Wellington bomber and the 'bouncing bomb' used on the dams raid). Nevil Shute's next writing attempt, 'Marazan', an aerial drug smuggling story, was accepted and published in 1926. At this stage he decided on his peseuodonym of Nevil Shute, not wanting his writing to undermine his credibility as an engineer. As the R100 project continued he carried on with another novel, 'So Disdained', an aerial spying story, published 1928 (in US as 'The Mysterious Aviator'). By November 1929 the airship R100 was complete and ready for trials in 1930. Shute was by this time Deputy Chief Engineer under Barnes Wallis and effectively in charge of the project. The trials were successful as was a proving flight to Canada and back and the airship was then hangared whilst the testing of the competing government R101 was supposed to be carried out. In the event there was very little testing and R101, en route to India on a proving flight, crashed in France killing 48 of the 54 passengers and crew, ending all development of airship travel in England. Nevil Shute had become engaged to be married to Frances Heaton, a doctor at York Hospital and at the end of the R100 project, when he found himself unemployed and newly married, he decided to start an aeroplane manufacturing company (as one does!). Aviation was booming and with a senior designer recruited from De Havillands and the backing of aviation pioneer and entrepreneur Sir Alan Cobham, the firm of Airspeed Ltd. was formed. Based at first in Yorkshire it held its first board meeting in 1931 with Shute as Joint Managing Director. 'Lonely Road', a novel of gun-running and political revolution, was published in 1932 and selling the film rights brought an additional welcome income but the next novel, 'Ruined City' about the depression in the shipping industry, did not appear until 1938, a reflection of his concentration on the fledgling company. Producing gliders under licence to earn some quick income, eventual success for the company came with multiple orders and a move to a new factory at Portsmouth but still little, if any, profit. 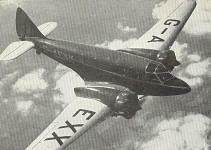 The Airspeed Oxford, a twin engined trainer, was used to train most Bomber Command pilots and 8751 were built (most under licence by other manufacturers). The peak for Shute was selling one of their aircraft, an Airspeed Envoy (left), to the King's Flight in 1937 but this had been at the cost of little home life with his wife and two daughters except for occasional weekend cruising in their yacht, Skerdmore. In 1938, with war brewing and orders for aircraft for the RAF in the hundreds, the Board of the company dispensed with Nevil Shute's services, an action which he says in his autobiography 'Slide Rule' (1954) was probably quite right - his forte was as a starter of companies and not a runner. With a generous settlement from Airspeed Nevil Shute could now reassess his future. Prior to the outbreak of WW2 in 1939 saw the publication of 'What Happened to the Corbetts', his account of Britain under aerial bombing attack and which his publishers, Heinemann, had issued in a special paper covered boards limited presentation edition (illustrated right) for the personnel of the newly formed ARP. By 1940, deciding to give up engineering research to take part in the war, he joined the Royal Naval Volunteer Reserve. Within two weeks Sub. Lt. Norway was seconded from his training ship, still in civilian clothes, by the Admiralty's Department of Miscellaneous Weapons Development where they wanted someone with aircraft experience to work on combatting air attacks on shipping. The DMWD (nicknamed the Wheezers and Dodgers) were a group of highly qualified scientists and technicians who evaluated numerous proposals for aiding the war effort, some highly successful and others less so. Amongst them was a project inititiated by the Petroleum Warfare team of a large flame thower firing a mixture of diesel oil and tar as a shipboard defensive weapon - an idea familiar to those who have read his novel 'Most Secret', 1945. He wrote the foreword to the history of the work of the department, 'The Secret War 1939-45' by Gerald Pawle. His novel, 'No Highway', 1948, covered the problems of metal fatigue and sudden in-flight failure of structures in aircraft, almost as if he had prior knowledge of the Comet disasters of the 1950's. Prior knowledge and second sight were themes that recurred and he also uses them to effect in 'An Old Captivity, 1940, and 'In the Wet', 1953, set in the rainy season in Australia. 'Round the Bend', 1951, a story of diligent aero engineer is set against the background of the development of a commercial air freight company. After the war, disillusioned with political changes and the financial restraints of post-war Britain, Nevil Shute had settled in Australia and his later novels reflect this change of domicile. Probably his most famous was 'A Town like Alice', 1950, a love story set firstly during the Japanese occupation of Burma and the East Indies and later in Australia. Throughout all of his books you find him drawing on his personal experiences, whether in the aircraft industry, wartime or his sailing but, authentic as they are, these are only the background settings. He had a natural ability to tell a story, to build characters that are sympathetic and to write in such a way that grips the reader. One gathers from his autobiography that he spent his life as if each day were of 30 hours instead 24, in his engineering days doing a full days work before starting his writing in the evenings. Such a pace would wear down even a physically fit man but he had a long history of heart problems which finally caught up with him and he died 12th January 1961 at the age of 61 years. Click for the full Bibliography of all Nevil Shute's works and for far more information see the Nevil Shute Norway Foundation. The winner will be announced on Tuesday, 19th October at an awards ceremony in the Royal Horticultural Halls in Westminster, London. Dominic Winter will be offering a rare copy of Aesop's Vita et Fabulae - Life-story and Fables - at their auction on 7th October. One of only three copies known to exist, it was published in Milan in 1497 and consists of a bibliogrpahy of Aesop and 67 of his fables. Illustrated with woodcuts it is expected to make £3,000 but if four pages had not been missing then the expectation would have been more than three times that. Stella and Rose's Books, one of our cooperative members, are among the eight companies short-listed for the final of the DTI E-Commerce award in Wales. This award is to recognise and reward those organisations that have demonstrated excellence through the use of the Internet and other Information and Communications Technologies and is open to businesses with fewer than 250 employees. Stella and Rose’s last year won the Viking Mail Order small business award.